Setting social media goals is a key step toward proving (and improving) the value of your social media work. Writing your goals down and regularly reporting on your progress also significantly increases the likelihood that you will achieve what you set out to do. Goals help you chart a course for improvement and success. They allow you to see how effective your efforts are. They give you purpose and direction, in a documented way that you can share with others. Before you can start thinking about what you want to achieve with your social media goals, you need a clear picture of where you stand right now. That means you need to conduct a social media audit. A social media audit will help you record all your existing social media accounts and programs in one place. You’ll also get a sense of your current level of performance, which you can use as a baseline. We’ve got a whole post that walks you through a social media audit, complete with a free template to track everything. Once you’ve completed your audit, look through the information you’ve gathered. You’ll start to see which social channels are performing well, and which might need a different focus. Take a look at your overall business strategy and your social marketing plan and look for ways to better align the latter with the former. Once you decide what kind of growth or improvement can really help improve your business, it’s time to start crafting some specific social media goals. Anyone can pull a lofty goal out of thin air, but that won’t help you improve your business results or even measure progress. For your social media marketing goals to be useful, they need to be realistic and trackable. They also need to be tied to clear objectives that will help you make progress. Established goal-setting frameworks help you put in the work upfront to create meaningful social media goals that will support your business in the long run. Here are a couple of our favorites. Specific: Be clear. Does “increase engagement” mean you want 100 new followers or 1,000? Making your social media goals specific helps you track progress and measure success. Measurable: Every goal needs some kind of metric. “Improve customer service” is a great concept, but it’s not a goal unless you have a way to measure that improvement. Attainable: Your social media goals should absolutely require you to stretch, but they should be within reach if you put in the required work. Relevant: This is the piece that ties your goal-setting back to larger business objectives. If your goal involves increasing Facebook likes, for example, make sure you understand how that will benefit the business. Timely: Deadlines keep everyone accountable. Include a timeframe for completion of your goal so you know when to check in on your success. You might also want to include some milestones along the way for incremental check-ins. The idea is that effective goals embody all of these qualities. Let’s look at an example. Adidas has set several goals relevant to making their business more sustainable, based around a set of six priorities. Specific: They don’t just want water savings, they want specific percentages of water savings in various contexts. Timely: The goals have a set deadline: 2020. OKR stands for Objectives and Key Results. It’s best known as the goal-setting framework favored by Google. Unlike S.M.A.R.T. goals, OKR goals are not meant to be 100 percent achievable. The objectives are meant to be very ambitious, and reaching 60 or 70 percent success is considered a win. 1. Where do we want to go? This question addresses the goal-setting element covered by the “relevant” component of S.M.A.R.T. goals. What do you want to achieve and what is the impact on your business? These are your objectives. 2. How will we pace ourselves to track whether we are getting there? This covers the “specific,” “measurable,” and “timely” aspects of S.M.A.R.T. goals. What are the specific results that will indicate progress or success? What will you track and measure? You should have about three key results for each objective. Remember: The “achievable” element of S.M.A.R.T. goals does not align with the OKR framework. OKRs are generally meant to be stretch goals, so 100 percent achievement is not the aim. Here’s an example from “Measure What Matters” by John Doerr, a venture capitalist who has worked with some of the world’s top companies and is a strong advocate of OKRs. Doerr does not reveal the specific numbers YouTube used, since that’s confidential. But you get the idea. How did YouTube do on meeting that goal? While they originally aimed for the end of 2016, they announced a billion hours of views per day in February 2017, just a couple of months late. Since OKRs are meant to be a stretch, that’s a success. Want to get deep into OKRs? In the video below, Google Ventures partner Rick Klau explains exactly how to set OKR goals. As you work your way through the goal-setting steps above, you’ll need to think about what you want to achieve with your social media strategy and goals. Remember, though that these are general goal categories, rather than goals themselves. You’ll need to use one of the goal-setting frameworks above to develop these concepts into specific goals for your company. For each type of goal, choose the metrics most relevant to your objective. Then, aim for a percentage improvement within a set timeframe. For detailed explanations of the metrics, including how to track them, check out our post on social media metrics that really matter. Brand awareness indicates how many people on social know you exist and understand what kinds of products and services you offer. Use streams to make sure you measure brand mentions that do not use your @handle or branded hashtags. Brand reputation can mean different things to different companies. For B2C organizations, it might be all about your popularity and customer satisfaction. For business-to-business brands, it might be industry perception and thought leadership. Here’s an example goal straight from Google’s re:Work, following the OKR format. Building an engaged community means you have a ready audience that wants to hear about the latest developments at your company. That’s a huge asset when you launch a new product, and to ensure regular ongoing sales. This is a great social media goal for marketers because it directly relates to the business’s bottom line. When your social media efforts bring in sales, it’s easy to show the value of your work. Remember that a conversion is not the same as a purchase. A conversion might be signing up for a free newsletter or downloading a free whitepaper. But every conversion has real, measurable value for the company, even if there is no cash exchanges hands. Social media is a powerful market research tool, as we’ve explained in posts on Facebook Audience Insights, Facebook Custom Audiences, and how to define your target market. Rather than tracking key social media metrics, for this goal you can use internal milestones, like building out (or updating) your buyer personas. It’s unusual to make a sale the first time a potential customer encounters your product online. Bringing in leads is a key way to use social media to fill your sales funnel and produce value for your brand. Conversion rate is an important metric for lead generation social media marketing goals. Use it to track how many people are signing up for your lead-generation offers like white papers and contests. You could also use internal measures to track how many leads your sales team is bringing in, and how well they convert those leads to customers. Social channels are an increasingly important platform for customer service and support. In fact, social messaging is now the most preferred customer service channel in the United States. Customer satisfaction score is an important metric to track for customer service-related social media goals. You’ll likely also want to track internal metrics like number of service requests tackled per customer service rep. Bringing in successful candidates is another form of conversion. 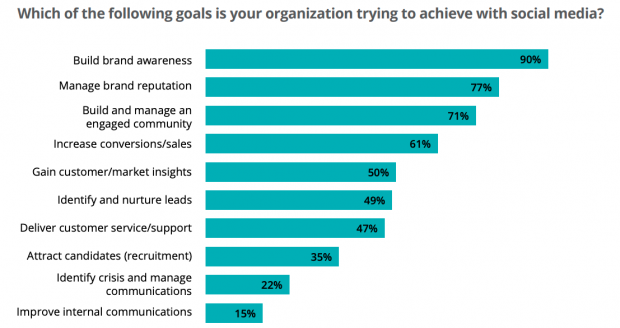 So, conversion metrics are important when tracking recruitment social media goals. It may also be useful to track followers and engagement on LinkedIn. But rather than sheer numbers, you’ll also want to ensure you’re bringing in quality candidates who are appropriate for the types of roles you need to fill. Work with your HR team to develop a clear picture of their needs and establish criteria for evaluating social media goals related to recruitment. Your social media response to a crisis can make or break your brand reputation, so this goal is very closely related to goal number 2. Tie your measures and key results to concrete internal steps like developing a social media policy, securing your social accounts, and nailing down your crisis communications plan. Social is an important channel for building and communicating with your internal teams. Solid internal communications are also the basis of an effective employee advocacy program. Use Hootsuite to achieve your social media goals across all platforms. From one dashboard you can easily schedule and publish posts, interact with your audience, monitor conversations around your brand, and measure performance with real-time analytics. The post How to Set and Reach Social Media Goals (+ 10 Types of Goals to Track) appeared first on Hootsuite Social Media Management.